​Good health in today’s world can be difficult to achieve due to our toxic environment. Many people have complex or multiple health issues and overcoming them may require some work. For this reason I have developed this Health Recovery Plan (HRP). I sometimes think of it as the Master Miracle Protocol, and because it is a combination of various protocols, it truly is a Health Recovery Plan (as restoring health is a process). The good news is this: If you will follow the basic fundamentals as outlined in our Health Recovery Plan, after working with thousands of suffering people, I am confident that you will get well in a relatively short time, as others have done. Remember, MMS does not heal the body as such, it destroys pathogens and oxidizes poisons that prevent the body from healing itself. Use this plan, as given in the Heal Recovery Manual, for all diseases. This book is chock full of a number of protocols that when followed properly, help restore people’s health. Our Key Protocols go together with a number of Supporting Protocols to make up the Health Recovery Plan. It is important to know that there is an overall sequence or strategy to the Health Recovery Plan. I have put it here, towards the front of this book, for an overview and for easy reference. For those who have not yet worked with MMS, at this point it may not yet make total sense how this plan works, but it will become clear as you learn the protocols outlined in this book. The important point is that there is a sequence of how to use the protocols. If one’s recovery comes to a standstill after the herein stated period of time, keep in mind this is always an indication it’s time to change something, go to the next step, and refer often to this section of the book as needed. All the protocols can be used for children. They must, however, be adapted according to the child’s weight. See Chapter 13 for instructions on how to adjust protocol dosages for children. The Starting Procedure is essential to get each person started out on the right foot in an easy manner. This protocol calls for very small doses of MMS1 per hour in order to get the body accustomed to it. Protocol 1000 is our primary protocol that kills disease pathogens, destroys poisons, and removes heavy metals from the body. We have found that a very wide range of illnesses have been overcome with Protocol 1000 alone. Protocol 1000 Plus is a procedure that calls for the addition of a specified amount of DMSO to the dosing. The DMSO carries the MMS deeper into the tissues of the body to find and eliminate poisons and pathogens hidden there. Protocol 2000 finishes off or does what Protocol 1000 and 1000 Plus could not do. This is our hard hitter that handles diseases that are so well established that they cannot be reached by Protocols 1000 and 1000 Plus alone. This is also the main protocol to overcome cancer and most life threatening diseases. Protocol 3000 simply adds to Protocol 2000 to make it even more effective. It is an additional way of getting MMS into the body through the skin without going through the stomach as in oral doses. The Mold/Fungus Protocol includes the addition of bentonite clay used in conjunction with MMS1. If you are not making progress with the protocols you are on, it may be necessary to switch for a time to the Mold/Fungus Protocol. You may consider starting with this protocol immediately after the Starting Procedure, but before continuing to Protocol 1000, if you feel you have come in contact with mold/fungus and suspect that mold is the root of your problem. As mentioned above, these six protocols are our Key Protocols in the lineup for health recovery. There are a number of Supporting Protocols to go along with these depending on what the illness is. In many cases people recover their health long before they finish all of the protocols in this Health Recovery Plan. However, there are those whose illness requires going the extra mile. Some of the Supporting Protocols address specific problems and diseases and thus it is necessary to add them on (usually after Protocol 3000 but sometimes earlier) while on the Key Protocols. The instructions in this chapter will help you determine this. If you see progress—keep up with what you are doing. Do not change anything. Do not go to the next protocol. Do not increase to the next drop; when improving, just keep on doing what you have been doing until well, or until you no longer see any progress, in which case you would go to the next level. Anytime you are experiencing nausea, diarrhea, vomiting or excessive tiredness and/or are feeling worse than your illness is already making you, reduce your MMS intake by half. If these symptoms continue, then continue to reduce by one half until you are no longer feeling worse than your illness is making you feel. Then when Herxheimer symptoms (nausea, diarrhea, etc.) subside, build back up slowly to the proper dosage as per the protocol you are on, but not to the point of making yourself feel worse than your illness is already making you feel. If you do not see any progress towards healing within a five to six day period then go to the next level—ramp up—begin increasing your MMS intake. Depending where you are in following a protocol, add drops to your dose, and/or move on to the next protocol. Every time you add on a new protocol, do not stop what you are already doing. Add on, but do not stop any of the previous protocols you were following. For example, say you are on Protocol 1000 and after the fifth or sixth day you notice some improvement in your condition, whatever it may be. The signs of improvement Chapter 67 are an indicator to keep on with Protocol 1000, do not change anything, keep at it. On the other hand, if you are on Protocol 1000 and you have completed five or six days of the protocol and you have not noticed any signs of progress or improvement, then move on to Protocol 1000 Plus and so on. Starting Procedure: Always begin with the Starting Procedure. Simultaneously, along with the Starting Procedure, get started with the Two Fundamental Steps which are brushing your teeth with MMS1 and using the spray bottle if any skin problems exist. (Complete instructions are given on pages 73-78.) In addition, if there are any external tumors on the body, this is the time when one would also begin applying the MMS1/DMSO Patch (page 135). Move on to Protocol 1000, and continue with this protocol as long as you see some type of improvement. But when there is a period of five or six days on Protocol 1000 and you do not see any signs of improvement, the first thing to do would be to make sure that the MMS is not being neutralized by anything (see pages 42-45, 52, 56). In addition, check the list for other reasons you may not be having success with MMS (Chapter 8). Then, if you are following everything correctly and you see no signs of improvement after five or six days, then go to the next level—which is Protocol 1000 Plus. Continue on Protocol 1000 Plus as long as there is improvement, but again, if there is no improvement for a period of five or six days, once more go to the next level, which is Protocol 2000. When on Protocol 2000, including taking MMS2 beginning on the third or fourth day, as long as you are improving continue with this protocol. But if there are no obvious signs of improvement for a period of five or six days, add on Protocol 3000. After adding Protocol 3000, continue as long as there is improvement, but if there is a period of five or six days and no improvement, you can begin with the various Supporting Protocols. These protocols (explained further on in this book) offer additional ways to help your body recover. You keep adding on more protocols until well. Last, but definitely not least of Key Protocols in the line-up, is the Mold/Fungus Protocol. If you are not seeing success with Protocols 1000 through 3000, please consider switching to the Mold/Fungus Protocol for a time. There are many illnesses caused by molds/fungus so please carefully read the details explained in the Mold/Fungus Protocol on page 99. Mold is a type of fungus. I have learned over the years, that there are some types of fungus that MMS1 and MMS2 do not seem to kill. However, I have found that when this is the case, usually clay will handle the problem. So if one is not getting the desired results with MMS1 or MMS2, it could be an indicator that mold/fungus is causing the illness and this would be a signal to add clay to your protocol. Another important point is that I believe, as do some doctors and health practitioners, that some varieties of mold/fungus can act as a type of protective shield for some diseases in the body. When this is the case, some pathogens may not be overcome by MMS because the mold that is present provides a certain amount of “protection” for them. In this case if we eradicate the mold Chapter 69 first with clay, as the other pathogens lose their “mold protection”, MMS is then able to destroy them as well. This may happen with both Lyme and Candida and possibly other diseases. Candida itself is a fungus and the clay can help eliminate it. But if other types of fungus are also acting as a protective shield for the Candida, then it is important to handle this problem first, so MMS can do its job. You can put on hold any protocol you are doing and do the Mold/Fungus Protocol anytime that you feel you need to do so. Interjecting the Mold/Fungus Protocol will not be a problem and will not harm the progress that you have already achieved, and then once you have finished the Mold/Fungus Protocol, you can go back to whatever protocol you were on and continue with it until full health is recovered. If when taking MMS1 orally you experience burning as it goes down, or a heartburn type of sensation, this could be an indication that mold/fungus is present internally. This would be a signal to do the Mold/Fungus Protocol (see page 99). When using MMS1 externally and it burns and stings badly, use the clay and Vaseline salve (see pages 106- 107). As has already been stated, anytime MMS makes you feel worse, (in other words, you are experiencing symptoms of a Herxheimer reaction—nausea, diarrhea, etc.) reduce the dosage by 50% but do not stop. Continue to reduce your dosage if you continue to feel worse than your illness is already making you feel. If you feel extremely bad, stop for a few hours, or a day, until the unpleasant symptoms pass, but once the symptoms do pass, start to slowly build back up your MMS intake to the proper dosage for the protocol you are on, as long as it does not make you feel sicker than your illness is already causing you to feel. Remember, each time you ramp up your MMS intake and add on another protocol, do not stop doing what you are already doing. Add on, but do not take away or stop what you are already doing. ​Make physical activity part of your daily routine. Get proper rest. Reduce stress in your life. Cultivate good relationships with others. Embrace a daily spiritual practice. Strengthen your immune system through following a good nutritional plan. Eat real food. If you have cancer or another life threatening disease, it may be necessary to move more quickly into Protocol 2000 without observing the five to six day intervals before adding on a new protocol. You can determine if it is time to move more quickly by the way things are going. If you are feeling pretty bad and again, you have a life threatening disease, you may want to go at a faster pace with the protocols, but without getting sicker than you already are from your illness. In this case, even though I just said you can move more quickly, you should nevertheless, always start out with the Starting Procedure—do not bypass this step. It is important to understand that the more advanced the disease, the slower you must go to begin with. If you detoxify the body too quickly, it can make one very sick. Getting sick, when you are already pretty ill is not a good thing. This can further weaken the body, and in the long run slow down the overall healing process. Pay close attention to how your body is responding. Each person is different; some may be able to go at this fast-track pace, on the other hand, others may need to go at a slower pace than is suggested here. We have heard of remarkable recoveries from life threatening illnesses when the person took only 1 drop of MMS1 an hour. It is not a race to see how much MMS you can handle. Listen to your body, and remember, it is extremely important to always follow the Three Golden Rules of MMS. In general I have recommended that one start adding on the Supporting Protocols if you have reached Protocol 3000, and have not fully recovered health. In part, this is because working through the Health Recovery Plan is a process. Overall, the body needs some time to become accustomed to each new addition in the process. Adding too many things all at once can be overwhelming, and/or possibly cause Herxheimer reaction. I do not wish for anyone to become weary and give up, which could hinder recovery. This rule of when to add on a Supporting Protocol is not hard and fast. It is a guideline. It goes without saying, any time you have a persistent cough, do the Cough Protocol. A woman with breast, cervical or uterine cancer may want to begin the Douche Protocol earlier on, even as early as while on Protocol 1000 in some cases. If she is handling MMS well and feels she can add a few douches to see if that also helps her improve, it may be worth the try. Someone with colon cancer may want to add enemas or colonics at some point before reaching Protocol 3000, if they feel up to it. Another example of adding on a Supporting Protocol before reaching Protocol 3000 would be in the case of using the MMS1/DMSO Patch for any external tumors. Pay close attention to the signals of your body and follow what you feel you can handle. See Chapter 7 for a list of diseases giving you examples of using the Supporting Protocols, and when to add them into your health recovery routine. The Additional Protocols in this book are different than Supporting Protocols in that they are specific to a particular disease. Certain diseases require a different procedure than the HRP. For example, malaria requires taking two stronger than usual doses of MMS1. In most cases this eradicates malaria, but if there are complications, the Malaria Protocol gives further instructions specific to malaria. Sometimes an Additional Protocol may suggest going to the HRP at some point, after following certain specific Chapter 73 procedures particular to that disease. To learn more about the Additional Protocols see Chapter 11. Almost all diseases are influenced to a large or small extent by the condition of the mouth and the teeth, therefore all protocols listed in this MMS Health Recovery Guidebook should be accompanied by a daily brushing of one’s teeth with MMS1. It has been shown time and again that MMS1 can restore health to the mouth and in the case of doing these protocols, better results are often noticed when brushing with MMS1, even when the teeth and mouth are in very bad shape. This does not mean that one will not need the services of a good dentist, but once the infections and diseases of the mouth are gone then the dentist can do a much better job, and the diseases of the body are 10 times more likely to be overcome. Thus a preliminary step to this recovery plan is to buy a good soft tooth brush for brushing teeth and gums while at the same time doing the protocols. If you use a toothbrush with toothpaste some of the time, keep a separate toothbrush that you use only with MMS1 (and DMSO if you use it). This will help avoid toothpaste residue left on the toothbrush mixing in with the MMS1. Under no circumstances should you ever use toothpaste which contains fluoride. In a glass activate 5 drops of MMS. After 30 seconds add only 1/4 cup (2 ounces/60 ml) of water to the MMS1 drops. Do this 2 or 3 times a day while doing the protocols in this book. For a number of years, people around the world have been successfully using MMS1 to keep their mouths in shape and to overcome various teeth and gum infections. You don’t have to worry about the alkalinity of the sodium chlorite nor the acidity of MMS1 leaching mercury out of your teeth. This is because the acidity in the MMS activator when mixed drop for drop with the MMS (sodium chlorite) which is alkaline, is calculated to mostly cancel one another out, leaving the MMS1 solution much closer to neutral. If your teeth are in poor shape, for example if you have an abscess, pain, or more serious complications with your Chapter 75 teeth, add DMSO to your teeth brushing routine. DMSO will carry the MMS right through the enamel into the tooth and can help solve many problems. Mix up the MMS1 teeth brushing mixture described above. q Brush your teeth with this mixture for a minute or so. This is for an initial cleansing of the mouth and teeth and to clear out anything you do not want DMSO to “carry” deeper into the tissues and enamel of your teeth. After this initial cleanse, rinse your mouth well. Next, add DMSO to the rest of the MMS1 mixture and continue brushing with DMSO added. You must add DMSO to your mixture immediately before continuing to brush. Add 3 drops of DMSO for each 1 drop of MMS that you are using. For the formula above, this would be 15 drops. If you have DMSO that is already diluted some, use 4 drops for each MMS drop. Tip: If you want to use the same solution described in the Brushing Teeth Procedure for more than one brushing, you will need to put the solution in a bottle with a tight lid. If you want to dip your toothbrush into the liquid, it is no longer reusable. So if you want to “dip” do not contaminate your entire mixture. Instead, pour part of the solution into a small glass and proceed with dipping your tooth brush into that liquid 3 or 4 times while brushing, then discard any leftover “dipping” solution. Double the amount activated drops of MMS to 1/2 cup [4 ounces/120 ml] of water) to make up a portion for the day. If you make up this solution for the day, you cannot add DMSO. DMSO must be added immediately before use, as over time, it will weaken your MMS solution. While on this Health Recovery Plan, if you have any kind of skin problems, be it skin cancer, eczema, psoriasis, infections or wounds, etc., spraying the skin or wound with MMS is a great help. I have listed this protocol in the fundamental steps for the HRP (Health Recovery Plan), because it is important for skin problems to start right away with spraying the skin as you begin your health recovery. Using this spray bottle is also helpful for most any type of isolated skin problems as well, such as wounds or bruises, to help the overall condition of the skin, and many more conditions. It can be used for the rest of your life for skin problems, whether you are on the other protocols or not. Anytime the MMS spray stings or burns your skin go to the Mold/Fungus Protocol and check the section on the mold/fungus external procedure (see page 106). The standard spray bottle formula is 10 to 1. That is, 10 activated drops of MMS to 1 ounce/30 ml of water. Never use tap water for any MMS mixture as it is not safe to risk getting chlorine, fluoride, or other impurities in the solution. Use only bottled drinking water, reverse osmosis, or distilled water. In most places 2-ounce or 4-ounce size spray bottles are available at the pharmacy or in health food stores. Chapter 77 Simply multiply the formula, 20 drops MMS1 to 2 ounces of water, or 40 drops of MMS1 to 4 ounces of water. In general this mixture will last up to a week or so. You will know that it lost its potency when the original color begins to noticeably fade. q Do not leave your spray bottle in the sunlight; storing it in a dark place will help the MMS1 solution to remain strong. Use this for spraying all problems on your skin. When using an MMS1 spray bottle on your face, avoid getting it in your eyes. Tip: You can spray a little on your face and then spray or pat a little DMSO (dimethyl sulfoxide, see Chapter 4) on top. Rub your face lightly to help ease wrinkles. DMSO often makes the MMS spray more effective anywhere on the body. When spraying both MMS1 or DMSO on your face, avoid getting it in your eyes. If you do not see results with the 10-to-1 MMS1 spray bottle, you can increase the strength of your spray solution up to as many as 50 activated drops of MMS per 1 ounce/30 ml of water. Always begin with 10 activated drops (MMS1) per 1 ounce/30 ml, and increase the drops in increments to see what works best for you. Anytime the MMS1 spray solution stings and/or burns, regardless of how weak or strong it is, it most likely is an indication that some type of fungus is present. In this case, rinse it off with purified water and apply the clay and Vaseline salve described in the Mold/Fungus Protocol (pages 106-107). We have received feedback from many people who have used MMS2 in a spray bottle with positive results for the skin. Both MMS1 and MMS2 help the skin in varying ways, so try them both, and see what works best for you. Please note, in the directions below there are some differences in the use of MMS2 and MMS1 when used in a spray bottle. Add enough MMS2 powder (calcium hypochlorite) to a clean, dry spray bottle (a 2 ounce/60 ml or 4 ounce/120 ml size bottle works well) to just cover the bottom of the bottle. Fill the rest of the bottle with purified, distilled or reverse osmosis water. Shake it well to dissolve the MMS2 powder. Then put the MMS2 solution through a clean paper coffee filter into a clean dry glass. (If possible, use unbleached brown paper coffee filters.) MMS2 usually has small lumps that do not easily dissolve and if not strained out it will clog your spray bottle. 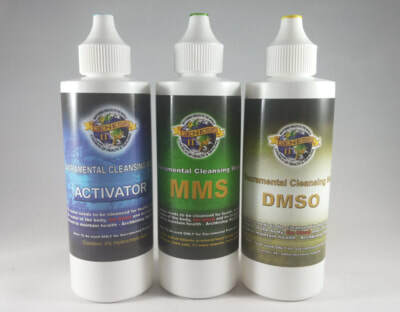 Before putting the MMS2 solution back into the spray bottle, be sure to rinse the bottle out well with clean purified water, to be sure there are no lumps that will clog up your sprayer. When using an MMS2 spray bottle on your face, avoid getting it in your eyes.